The Steam schooner Gipsy was built in San Francisco by Middlemas & Boole in 1868 and originally owned by Goodall, Perkins & Co and later by the Pacific Coast Steamship Co. Length 102 feet, Beam 28.3 Feet and 239 tons. 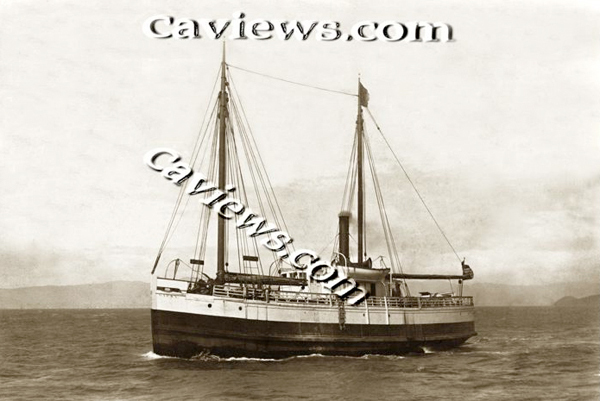 The schooner Gipsy ran aground at McAbee Beach on Monterey Bay in what is now Cannery Row on September 27, 1905. A Captain Thomas Boyd was at the wheel at the time of the wreck. California coast Shipwrecks and California	Beach Scenes, passenger liners. All images are also available for editorial downloads and one-time, non-exclusive, editorial usage rights.